High quality material, Made of high-quality felt cloth material, soft and thickened, lightweight and fine workmanship, well constructed and durable. Protects your backpack, it protects sharp objects(e.g. pens,keys,etc.) from damaging your bag , helps to protect the interior. The Backpack Organizer Bag with deisign 1 main zipper bag&1 fornt bag ;internal part,3 small pockets,3 mesh pockets; 1 elastic pocket.pockets, accommodate toiletries, clutter, key, cell phone, cards, books, travel goods etc. Please note:Before buying, please refer to the specific size of your outsourcing, to choose inside bag size smaller than outsourcing.You could generally to choose a small 1-2inch than the outsourcing. MATERIAL ---- Made of high-quality felt cloth material, soft and thickened, lightweight and fine workmanship, well constructed and durable. 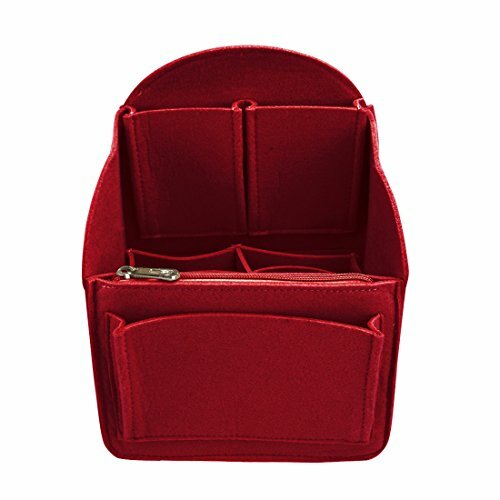 MULTI- POCKET ----The Felt Inser Bag with deisign 1 main zipper bag&1 fornt bag ; internal part,3 small pockets,3 mesh pockets; 1 elastic pocket, for accommodate toiletries, clutter, key, cell phone, cards, books, umbrella and other travel goods etc. Many pocket, Can keep your bag clean. APPLICABLE ---- Fits for a variety of models backpack, Keep your Handbag shape and shipshape. Could be used as backpack organizer, handbag organizer, diaper bag organizer insert, pocketbook organizer, cosmetic bag etc. If you have any questions about this product by YUENA CARE, contact us by completing and submitting the form below. If you are looking for a specif part number, please include it with your message.